Building an original deck that also does well is extremely rewarding. I won’t forget the first time I loaded into TTS and saw my opponent using the Vader1/Guard deck that I built and used to win the Artificery store championship. Or after my Top 8 performance at Nationals and everyone and their mom wanted to try out Thrawn/Snoke with Grand Moff. And more recently my Yoda/Leia3 list that won Atlanta. It is very satisfying to come up with something out of left field that no one else is running and actually doing well with it. But that’s not what this article is about, it is about when you try to think a little too far out of the box, and you crash and burn. 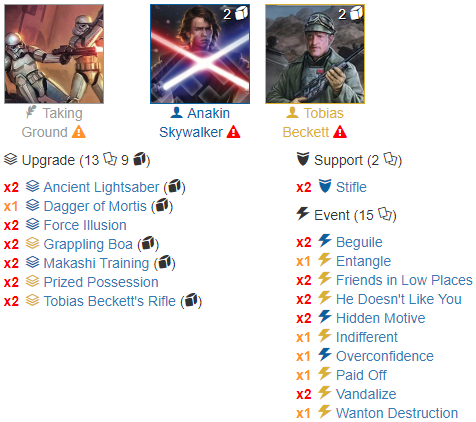 The idea behind this deck was “Beat Vader, be decent against everything else.” First, win the battlefield (which I did in all of my matches). 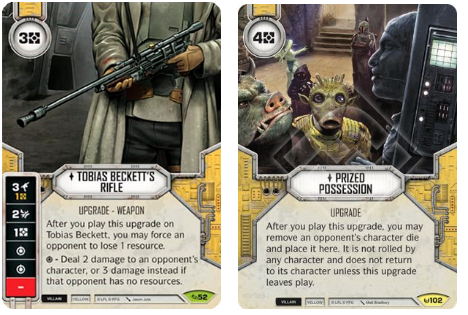 Then, use Theed Royal Palace’s power action to get Tobias’ Rifle out forcing your opponent to lose a resource when played on Tobias. Ideally, if you are against Vader take his die with Prized Possession crippling him and sealing your victory. The only problem was I was not matched against Vader although he was featured in a third of the decks at the tournament. I faced mill three times in a row and was 2-1, but after I was quickly destroyed by an aggro deck, I knew I had no chance left to get to the top cut. Even if you are correct in guessing the meta and you have a counter to it, what you actually will be matched with is out of your control. To try to get some inspiration and to make sure I wasn’t missing any obvious cards, I searched swdestinydb for lists using this character combination. I think this is the first time I searched swdestinydb and found no results for a character pairing. To anyone else, this would be a red flag (and it should have been for me too), but instead, I took it as a chance to once again bring an unknown deck and achieve glory. In conclusion, thinking outside of the box is essential to reshaping and beating the meta, and I do think this deck has some potential to be great. When building a deck, especially if you are trying to be competitive, make sure you play-test it (the more times, the better). The key to a strong, original deck is plenty of reps and constant optimization. Thinking outside of the box and creating an original deck can add a surprise factor giving you an advantage. However, your deck must be strong enough to hang with the tier 1 decks which is no easy feat. I hope you enjoyed this article. We can learn from my mistake to create powerful, original decks without thinking too outside of the box. If you want a full write-up about the tournament and the deck, let me know on the Artificery discord, and I will be happy to provide.